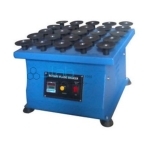 Shaking Machines And Stirrers India, Shaking Machines And Stirrers Manufacturer, Shaking Machines And Stirrers Suppliers & Shaking Machines And Stirrers Exporters in India. JLab is renowned Exporters & Manufacturers of Shaking Machines and Stirrers & Scientific Lab Instruments India, Shaking Machines and Stirrers Exporters, Shaking Machines and Stirrers Suppliers India. The complete body is mounted on heavy mild steel angle iron frame making it rigid and sturdy for smooth operations.